It would be great to see you there so make sure you pop in and say hi! I just wanted to let you know about a great venue in Maidstone, The Orchard Suite and Oak Rooms. This family run venue has been completely refurbished and is just absolutely stunning! It looks amazing in the photographs but in my opinion, really has to be seen to get the full affect. As you walk in, it has the real "wow" factor and every element has attention to detail. There are little features that make a big impact at the Orchard Suite, even the toilets are beautifully decorated with gorgeous finishing touches. The layout of the main room is brilliant for couples and their guests alike as the room is spread out, yet has a cosy feel and all the guests have a great view of the all important top table. They offer fantastic packages at a great prices and I am very honoured to have been asked to join their list of recommended suppliers, with my stationery being included in the Platinum Package they offer. The team at The Orchard are friendly, welcoming and extremely helpful, but don't take my word for it...go and see for yourselves! If you haven't found your perfect venue just yet, pop along, it could be the one for you. This questions is usually referring to the couple's names and quite often sparks a lively debate amongst the couples. When thinking about invitations, some people love to stick to tradition, however, in today's society traditions are changing... and fast. Traditionally, the woman's name would go first, as years ago, the bride's parents would be expected to pay for the wedding and the invitations would therefore be addressed from them. More and more couples are financing their own weddings to date and therefore the invitations are quite often from the couples themselves. This leads to many conversations about who should go first. Some couples choose to follow tradition anyway, some prefer to go in alphabetical order and others really aren't that fussed either way. The beauty of my job is that I can make invitations however people want them so the choice is really theirs to make. I wholeheartedly believe that you should have your stationery how you want it and encourage people not to worry too much about right or wrong and traditions and go with what you prefer as a couple. January is getting booked up pretty quickly with lots of consultations booked in already and some wedding fayres coming up too. I love meeting new couples so if you are in a quandary about invites or table stationery feel free to give me a shout. 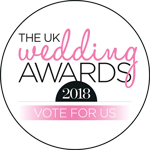 I am so proud and excited today to receive an email to tell me I have been shortlisted for the final of The UK Wedding Awards 2018. This is giant leap for my little homegrown business and overwhelmed doesn't even cover it. If you have ever bought or received a handmade card from me, got your wedding stationery from me or even received an invitation and you think I am worth a little vote, then please follow the link and vote for me. Voting is open to the public and winners are announced in Spring. Merry Christmas everyone and all the best for 2018! How can it be December already? Well, I can't quite believe it is December already, albeit the first day! It is all good news though, plenty of chequebook invitations being made. I like this for two reasons: Firstly, I don't think and have also been reliably informed that the chequebook invitations do not look as gorgeous online as they do in real life. I will be working on taking some better photographs as I want the true beauty of these invites to come across online. Secondly, I enjoy making them as there are so many variations to play around with. So it is here finally Friday! This week has been very busy and I am exhausted. It included lots of meetings with clients and a trip to London to see War Horse which, by the way, I highly recommend. Such a wonderful, skilled piece of theatre which had me captivated from the outset. Definitely go see! So, this weekend I have a table plan, some chequebook wedding invitations and some wallets to get underway and hopefully finish. Plus a sample of Tea Garden to make. It sounds like another busy weekend but then would I have it any other way?? Full time mum of three busy boys and self confessed craft addict. I work from home to supply wedding stationery that couples want rather than telling them what they can have. I like a challenge so enjoy creating bespoke stationery.